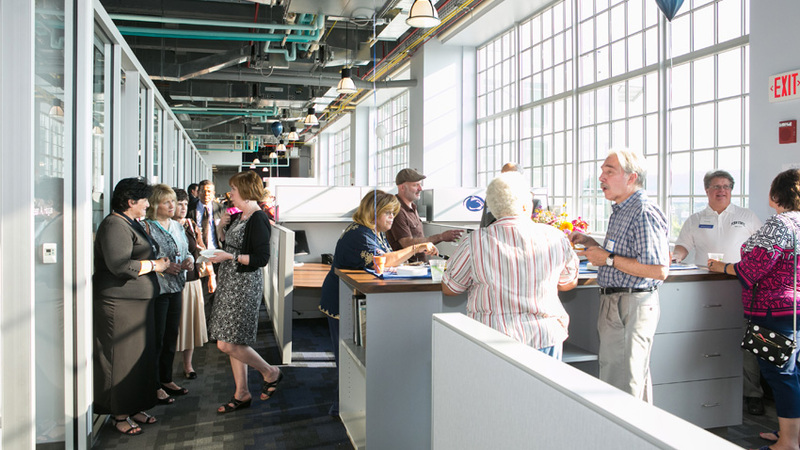 On September 2, 2015, years of planning came to fruition with the official opening of The Penn State Center Pittsburgh’s new office at the Energy Innovation Center. More than 250 guests, including local elected officials, Penn State leadership and community partners, celebrated the new location. The Penn State Center Pittsburgh, an office of Extension and Outreach and Online Education, provides an urban platform for the University in meeting its Land Grant obligation. Via a resident staff of more than 25 and Engaged Scholarship activities with faculty and students, research-based best practice is made available for community problem solving. Later in the day, Allegheny County Chief Executive Rich Fitzgerald welcomed all guests to the office during a program with Craig Weidemann, Penn State Vice President for Outreach and Vice Provost for Online Education, Barbara Christ, Senior Associate Dean of Agicultural Sciences, Dennis Calvin, Director of Penn State Extension, Robert Meeder, President and CEO of Pittsburgh Gateways Corporation and Deno De Ciantis, Director of the Penn State Center Pittsburgh. Presentations were also available on monitors throughout the office detailing onsite programming, expert staff bios, 2015 highlights and upcoming events. The conference room was converted to a small movie house with popcorn and a schedule of video shorts on the time lapse construction of the office and the art installation, a green infrastructure installation at Four Mile Run, One North Side summer intern work and Beltzhoover youth development. Guests were entertained by Quinta Voce, a professional woodwind quintet and dined on various appetizers. Desserts were served on the patio and included Creamery Ice Cream from the Rolling Cones Food Truck. Penn State Master Gardeners of Allegheny County provided onsite assistance as well as floral arrangements from their North Side demonstration garden. If you weren’t able to make it to the opening, give us a call and make an appointment to stop by. Any member of The Penn State Center Pittsburgh staff is happy to show you around!